Do you need a new hairstyle? Thinking of going a different color? What about Balayage or Keratin Treatments? 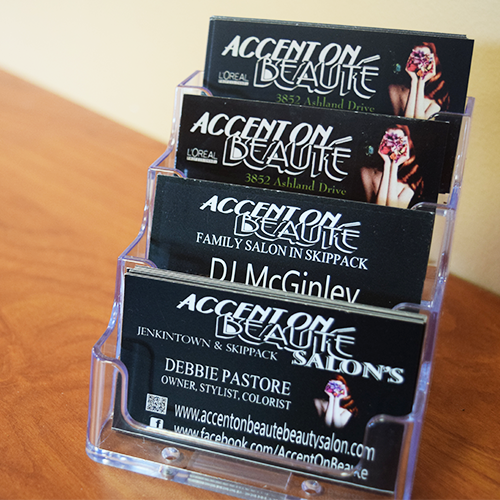 Debbie, DJ and their team of expertly educated stylists at Accent on Beauté, Tracy and Christianna, have all the tools to give you exactly what you are looking for, and then some. 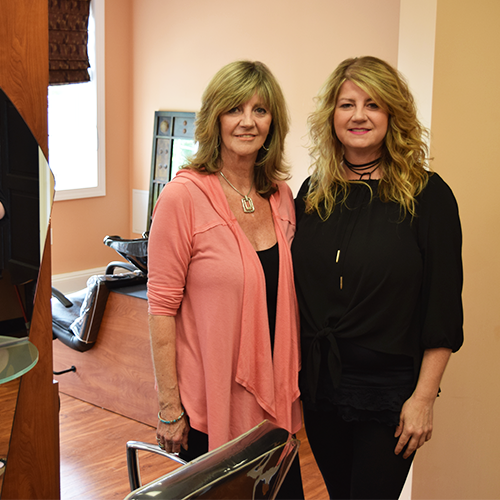 The Mother-Daughter duo, who have been working alongside one another for 30 years, decided to open their own place here after moving to Blue Bell and frequenting Skippack Village. They fell in love with the quaint and home-like atmosphere found throughout the village and in all of the shops. This was when they chose to call Skippack Village home for Accent on Beauté five years ago. 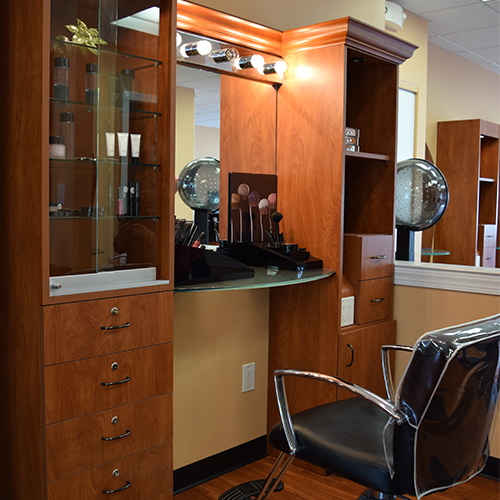 Located conveniently right off of Skippack Pike in the beautiful Biltmore Estate development, you will find Debbie & DJ’s clean, sophisticated and professional salon. As a L’Oréal Professionnel Artist of 27 years and counting, DJ travels to New York and California frequently to educate and certify stylists that are from all around the world on many services including one called Balayage. This is a type of hair painting method to highlight the hair. As opposed to the standard method of highlighting, balayage is used to create a natural look to the hair that avoids having to deal with the grow-out line that occurs with standard highlighting as soon as the hair start to grow out. This service is an affordable, fashionable, low-maintenance and natural-looking way to give your hair new life, multiply dimensions and contour your facial features. Not only does DJ travel to certify and educate stylists on this and other services, but their own team in-house is expertly trained and educated as well. 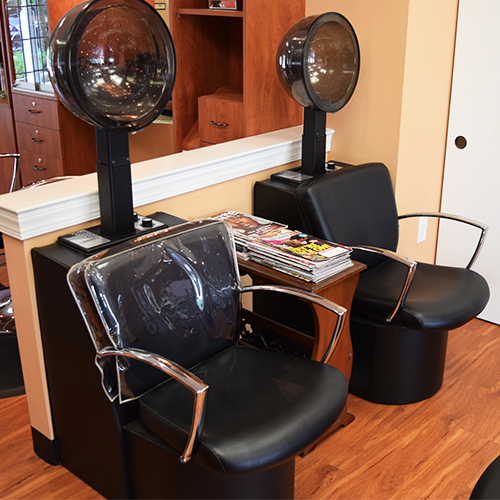 Other specialty services aside from Balayage that are offered by Accent on Beauté include Corrective Color, Razor Cuts, as well as Power Mixes. Power Mixes are treatments that are done to the hair to revitalize it with powerful nutrients from the inside-out, as opposed to other services that simply attempt to treat the hair on the outside of the follicle without nourishing the inside of the hair follicle. In addition to these specialty services, Accent on Beauté has also received L’Oréal technical expertise, and artistic inspiration from L’Oréal Professionnels. Due to this additional education and training, they are able to bring you the absolute best in expert hair care and design. You can find Debbie, DJ and their team at Accent on Beauté Tuesday through Thursday from 10:00 AM until 7:00 PM, or on Friday and Saturdays from 10:00 AM until 5:00 PM. Their phone number is (610) 584-4181 and their address is 3852 Ashland Drive Harleysville, PA 19438, located right off of Skippack Pike. You can also follow them on Facebook!